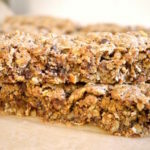 Easy recipe for homemade baked chewy granola bars that don’t fall apart and stay moist. They take just minutes and are healthier and tastier than anything you can buy! Line a 13″ x 9″ pan with parchment (or grease lightly) and preheat the oven to 325 degrees. Combine the butter, coconut oil, honey, and vanilla in a large bowl and cream together well. Add the oats, flour, flax meal, and baking soda and mix well. Stir in the add-ins. Transfer to prepared pan and firmly press mixture evenly. Bake for 18-20 minutes, until the edges are just browning. Let cool on a rack for 10 minutes, then score into bars (18 – cut 6 x 3 – for traditional bar size or 16 or 20 long and narrow bars) before letting cool completely in the pan. Remove from pan, cutting through bars as needed and store in air tight containers or baggies in the fridge or freezer. These are good at room temperature, too (which is nice for vacations and hikes), but I usually stick them in the freezer for longer storage – they freeze great! *For a peanut butter (or other nut butter) variation, replace 1/2 cup butter with nut butter (so you’ll use 1/2 cup nut butter with 1/4 cup butter or coconut oil total). **It’s your choice to use 1/2 c. chocolate chips to equal the 1 cup add-ins, we think it’s too much in these bars, so I use the lesser the amount.